Bluetooth technology is empowering developers and fueling innovation worldwide. Easy to set up and use, Bluetooth technology continues to be a popular choice for end users operating in a mobile setting. Star Micronics bolsters its "i" Series of printers with the launch of its expanded MFi certified Bluetooth printers with operating system support for iOS, Android and Windows. Apple MFi certified, the TSP700II BI, TSP800II BI and SP700 BI are approved for use with the iPod touch®, iPhone® and iPad®. For retailers or hospitality providers seeking a dedicated wireless labeling solution, Star is proud to introduce its TSP700II BI. Star's TSP700II BI supports 2D barcodes, PD417 and QR codes. Equipped with high print speed, high reliability, black mark label support and vertical mounting support, Star's TSP700II BI is ideal for servicing label printing in a variety of applications ranging from date labels on prepared foods at a local deli to price labels in a retail boutique. 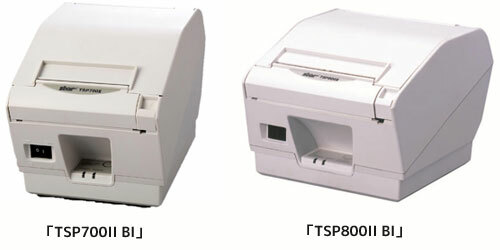 From compact web printing to mobile transportation printing, as well as producing wide high-quality POS receipts with professional and crisp graphics, Star's TSP800II BI is the perfect solution for servicing in vehicle delivery/service receipt printing and in vehicle law enforcement citation printing. Finally, Star's SP700 BI is specifically designed to function in the kitchen, where heat and humidity can erode the typeface on a printed order. Available with Bluetooth connectivity, the SP700 BI supports kitchens and back of house operations without wiring that can get in the way of staff. Star will exhibit the TSP700II BI and TSP800II BI at “SMARTPHONE & MOBILE EXPO” that will be held at Makuhari Messe for 3 days from October 29 to October 31, 2014. We look forward to your visit. The optional buzzer and Wall & Vertical Mount Kit are available for TSP700II BI and SP700 BI, and the Splash Proof Cover for TSP700II BI. Able to provides printing on 3” to 4.4” wide paper for applications that need to print a large amount of information on a receipt. “Made for iPod”, “Made for iPhone”, “Made for iPad” mean that an electronic accessory has been designed to connect specifically to iPod, iPhone and iPad respectively, and has been certified by the developer to meet Apple performance standards. Apple is not responsible for the operation of this device or its compliance with safety and regulatory standards. iPod is a trademark of Apple Inc., registered in the U.S. and other countries. iPod touch is a trademark of Apple Inc. iPhone is a trademark of Apple Inc. iPad is a trademark of Apple Inc.